In the third part of our series discussing how different time horizons are used in cash forecasting we explore all the elements of the monthly cash flow forecast. Selecting the right time horizon for a forecast depends on the business objectives of the forecast. By exploring the uses, benefits and drawbacks of the monthly cash flow model, you should be able to ascertain whether it is suitable for your business needs. Our other pieces, which discuss the daily cash flow forecasting process, and the 13 week cash flow model, are useful to read if you are setting up a new cashflow forecasting process. The key use of a monthly cash forecast is longer-term planning for strategic and tactical purposes. Unlike a daily or weekly forecasting process, a monthly cash forecast is not focused on the day-to-day management of cash and liquidity but on the longer term. The business objectives of a monthly cash flow forecast are often management reporting focused. For example, senior management may require a monthly pack which includes a month-end cash forecast so that they can take a view on the health of the company’s liquidity reserves heading into the future. The drive to set up a monthly cash forecasting process can come from a range of sources. In some cases, there may be a desire for greater granularity than the annual budgeting processes can afford, but without getting down to the level of day-to-day or week-to-week cash management. This is often the case if senior management have asked to be guided on anticipated cash positions at year-end, half-year, or quarter-end. This can be an area of particular focus if management are seeking guidance on acquisitions activities or aid with the timings of any other significant capital expenditures. Depending on the circumstances of a company’s debt arrangements, covenant forecasting requirements can also be a catalyst to the setting up of a monthly cash forecasting process. What does a monthly cash forecast look like? As you would reasonably expect, the units of time included in a monthly cash forecast are months. However, it is also not unusual to have a hybrid forecast layout which works in combination with an additional time horizon. For example, the forecast view might show weeks in the short term, and then switch to a monthly forecast horizon after 13 weeks. The forecast itself is composed of top-level line items such as receipts, payments, intercompany flows, investing levels, and capital expenditure. These line items are usually captured at a relatively high level of detail, rather then getting down into the granularity of customers’ or suppliers’ details as you might expect to see on a shorter-term forecast. Typically, a monthly cashflow forecast extends six to twelve months into the future. However, certain businesses may extend beyond this, for example if they have a multi-year project to oversee. Additionally, many insurance companies require a longer-extending view because their particular planning purposes. In order to anchor the forecast view to the current business environment, as with most cash forecasting time-horizons, classified actuals are usually included. Unlike shorter-term forecasting horizons, where the process mostly consists of automated data flows from ERP, TMS, billing, and ledger systems, as well as automated data feeds from bank accounts, a monthly forecasting process is more closely aligned to a planning process. However, a key component separating a monthly cash forecasting process from shorter-term time horizons is the level of human involvement. As is the case with any process that is not entirely systems data driven, human input requires facilitation. The teams that are required to report into the process usually include the financial planning & analysis team, sales team, and any other department which would have an impact on the monthly closing cash balances. As would be expected, the forecast data is usually updated once per month. This encompasses the capturing of classified actuals for that particular month. Additionally, cash flows are generally captured in the base currencies of the underlying subsidiaries so that head office has the full picture and can implement hedging processes if required. As part of the monthly data refresh cycle, the forecast horizon would be extended by one month to replace the month that dropped from forecast to actual. The key advantage of the monthly cash forecast is that it provides a level of long-term visibility that aids business planning activities. As corporate treasury departments are increasingly offering strategic input into business planning, the monthly cashflow forecast is a key tool in their arsenal. Rather than being a burden, the level of human involvement in the process can be a boon because it provides understanding of the longer-term planning activities. 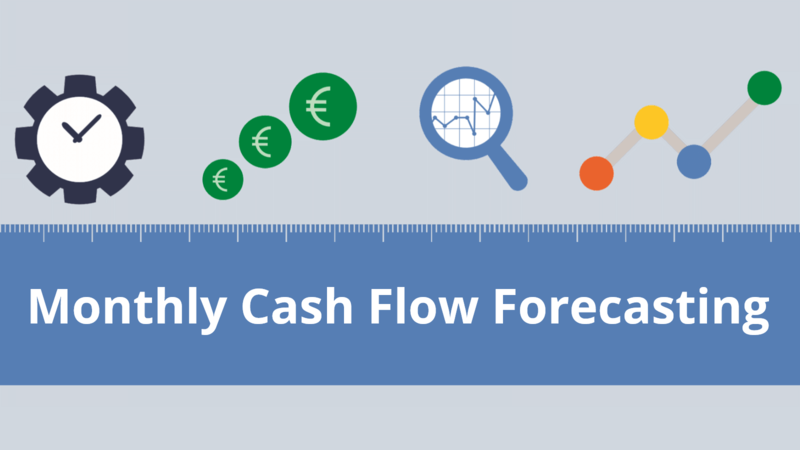 When is a monthly cash flow forecast not suitable? As referenced at the start of this article, in general, a monthly cash forecast would not be suitable for short-term liquidity planning. For short-term liquidity planning a daily, or a weekly, cash forecast would be more appropriate. To overcome the short-term limitations of the monthly cash forecast, as mentioned earlier, it is not unusual for a hybrid forecast to be used. This can often be the case for businesses who are seeking to use the forecast to manage liquidity risk. In this instance the hybrid model of weekly for 13 weeks could help to identify medium-term liquidity risk concerns, and a monthly horizon after 13 weeks could help to flag up any longer-term issues. As mentioned in previous posts, when setting up a new cash forecasting process, it is important to select a time horizon that aligns with the overall business objectives. As the table below shows, if the business objectives of the cash forecast are more geared towards supporting precise decision making, a shorter-term (or hybrid) forecasting horizon may be more appropriate. What are the benefits of using software? All cash forecasting processes can be improved with the use of specialist cash flow forecasting software, and there is no better time to introduce software than when you are setting up a new forecasting process or rolling out a new forecasting time horizon. While shorter-term cash forecasting horizons can benefit from automated upload of system data (as they are much more reliant on data from system feeds), using software in a monthly cash forecasting process greatly eases the administrative burden while enabling much greater cash forecasting accuracy analysis. CashAnalytics has helped many companies across a broad range of industries to build and maintain best-in-class cash forecasting processes that leverage software to produce the highest quality reporting and analytics outputs.